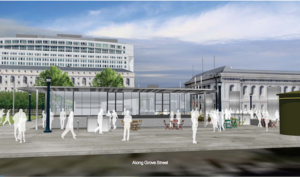 A rendering of the proposed Bi-Rite café in Civic Center (along Grove Street). Rendering courtesy of Sarah Holt (BRFOB Marketing Team). Some city approvals will need to happen first, but in a best-case scenario, the café would hopefully open in spring 2018. It would have glass walls and be transparent on all sides, and there would be outdoor seating. It would be open from the morning until early evening, serving pastries and breakfast sandwiches and coffee, plus salads, sandwiches, popsicles, and soft-serve ice cream. Will keep you posted. Civic Center, Grove at Larkin. A tablehopper scout named Lisa B. noticed Marin’s ~WOODLANDS MARKET~ is opening a location in the Lumina, a luxury condominium at 201 Folsom St. (at Main). It will have 9,500 square feet, and in addition to its extensive organic and sustainable selection of products, the market will also serve prepared foods, coffee, in-house juices, and fresh bread daily, plus there’s a pet shop and fresh flowers. The Belgian Bernal spot from the Pi Bar folks, ~BEL~, is sadly closing at the end of this month, and a new spot called ~OUTER ORBIT~ from Christian Gainsley and Elisabeth Kohnke will be taking its place. The pinball hall-restaurant hybrid will be styled like an old-school pinball salon, suitable for all ages and skill levels. In between pinball games, you’ll be able to nosh on Hawaiian-inspired bites, plus there will be beer and wine (and beverages for the kiddos). Look for an opening in early 2018. 3215 Mission St. at Valencia. ~THE PLANT CAFÉ ORGANIC~ at Pier 3 on the Embarcadero is now closed after 10 years in the location, and it looks like a place called ~SEASIDE~ is taking its place. We reached out to a contact involved with the new project, stand by. Tipster Lisa B. also noticed a sign going up for a ~BUCKHORN GRILL~ in the former Boudin Bakery at 619 Market St. at New Montgomery.